Iceland has passed radical new legislation to become the first country in the world where companies must legally prove they are not discriminating on the basis of gender. The new law - effective from 1 January 2018 - requires all private and public employers with more than 25 staff to obtain government certification of their equal pay policies – or face fines and auditing. Iceland already uses the Equal Pay Standard, a set of rules and regulations which companies use to measure the gender pay gap within their establishments. The new law means they are now mandated to undergo certification every three years based on this standard. Iceland, which has a population of about 335,000 and where 38 per cent of parliamentarians are female - above the global average - including Prime Minister Katrin Jakobsdottir, wants to eradicate the gender pay gap by 2022. The North Atlantic island nation was ranked first in the World Economic Forum’s (WEF) 2015 Global Gender Gap Index, followed by Norway, Finland and Sweden. But Icelandic women still earn, on average, 14% to 18% less than men. The United Kingdom ranked 18th out of 145 countries. The WEF reported last year reported an economic gap of 58 percent between the sexes and forecast women would have to wait 217 years before they earn as much as men and have equal representation in the workplace. “Iceland is ranked as world’s most gender equal country by (the World Economic Forum) ... Clearly Iceland is very serious about gender equality,” former New Zealand Prime Minister Helen Clark wrote on Twitter. “The new law by Iceland can help change attitudes to women in business as well as in politics, and inspire other countries to do the same,” said Virginie Le Masson, a research fellow at the London-based Overseas Development Institute. “Ample evidence shows that women work as much as men and are still paid less,” she added. US independent Bernie Sanders, a leading liberal voice in the Senate, called on the United States to follow Iceland’s example. “We must follow the example of our brothers and sisters in Iceland and demand equal pay for equal work now, regardless of gender, ethnicity, sexuality or nationality,” he wrote on his Facebook page. News of the new law was first announced on International Women’s Day in March 2017. That month, Equality and Social Affairs Minister Thorsteinn Viglundsson said “the time is right to do something radical about this issue”. In October thousands of Icelandic women left work at 2.38pm and demonstrated outside parliament to protest the gender pay gap. Women’s rights groups calculate that after that time each day, women are working for free. One of the most common arguments made about the gender pay gap is that it simply doesn’t exist. But the argument that “life choices” made by women are the real reason behind the gap is, in itself, an absurd oversimplification. Sure, many women choose to stay home or cut back their hours after having children. But many others don’t opt out. They’re forced out because they cannot afford child care, or find a full-time job that affords them any kind of flexibility. And, culturally, Americans remain ambivalent about women working outside of the home. A little more than 30 percent of Americans still believe women should stay home full-time to care for young children. These biases, which play out both in the workplace and outside of it, affect how much “choice” some women feel they actually have, and speaks to the types of judgments women face for making said choices. Plus, women face a well-known “motherhood penalty.” They’re less likely to be hired for jobs once they have children — unlike men, whose prospects improve. Another beloved means of dismissing the gender pay gap is to point out that women tend to work in lower-paying (i.e., traditionally “female”) fields, like teaching, nursing and social work. And yes, that’s true. “Women, as a whole, continue to work in lower-paying occupations than men do,” Pew says. But research has shown that even when women enter traditionally “male” fields, they make less. In fact, research looking at pay changes over decades has shown that when more women enter a traditionally male field, pay within that field begins to decline. As The New York Times reported, when more women began working in parks or running camps, for example, median hourly wages declined by 57 percentage points. Same goes for fields like design, housekeeping and biology. Conversely, when more men enter a traditionally female field, wages go up. Men and women who perform similar tasks in the workplace do not earn the same in Spain. Women’s hourly earnings are 12.7% lower than men’s, according to a study that is based on statistically adjusted EU data from 2014. This figure is lower than in 2002, the first year covered by the research, but it still evidences “some worrisome dynamics.” The gap exists across variables such as age, education, years of service, occupation, type of contract, length of working day, activity and company size. 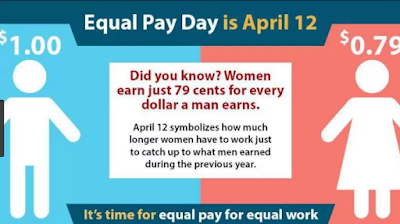 Gender pay gap deniers have long claimed that these differences in earnings stem from the fact that women tend to work fewer paid hours, have more precarious jobs, perform lower-paid work and have fewer job responsibilities. Yet this claim now appears to have been debunked by the adjusted figures, which emerge from a research project funded by the Foundation for Applied Economic Studies (FEDEA), and to which EL PAÍS has had access. The study was headed by José Ignacio Ruiz-Conde, a Spanish economist who teaches at Madrid’s Complutense University and is deputy director at FEDEA, a think tank that conducts research on economic and social issues affecting Spain. The project used data from the EU’s Structure of Earnings Survey for 2014, the most recent available year, which show that a woman’s hourly earnings are 14.9% lower than a man’s. But this figure is unadjusted and does not necessarily mean that the jobs are similar, or even comparable. In order to achieve a more homogeneous comparison, FEDEA researchers adjusted the figures according to impact on wages caused by variables such as age, experience, contract type and others. The result of this research is a pay gap of nearly 13%, compared with nearly 15% in the EU survey. If annual earnings are considered instead – and these are what really determine a person’s quality of life – the gap reaches 23% (€20,051.58 for women versus €25,992.76 for men). Paying a woman less than a man for the same position has been illegal since 1980. These statistical analyses do not claim that this is happening, since the data is not detailed enough to know whether two individuals are performing the exact same job in the same company and with the same collective bargaining agreement. Instead, these studies “measure whether men and women are receiving similar pay for similar tasks.” And that is where a pay gap shows up across variables. One of these is the fact that “the gap increases with age.” Women under 30 earn 4.7% less, and this percentage rises progressively to 17.2% among women over 59. Maternity could be an explanation, but researchers warn that the survey does not contain information about personal family circumstances, and so “it is not possible to estimate the effect” of child-rearing on pay gaps.